We’re excited to announce the recent release of the Judy’s Book reviews API. By accessing the API websites and apps can now get access to over 1 million reviews that span many categories, we also include full details of the business. Most of the Judy’s Book reviews come from moms and dads and tend to be weighted towards family type establishments. This allows brands to use and display Judy’s Book reviews on their properties to increase user engagement and deliver more content to their audience. Brands can get an API Key by contacting partners@judysbookteam.com . For those with limited development resources we also support a reviews feed through XML files. This entry was posted in Judysbook on September 24, 2013 by judysbookblog. Washington State is world renowned for its wines. One difference between the Northwest and many other areas in the US is that WA tends to have a more relaxed family atmosphere when it comes to wine tasting. Bringing the kids to a winery can be a fun event for all. Here’s our top Wineries that are also kid friendly in WA State. Chateau Ste Michelle Winery (KidScore 85) Chateau St. Michelle Winery is an adult heaven. But it’s also kid friendly enough to keep the kids entertained for a few hours. The main appeal is the grounds and park atmosphere. Children can feed ducks; view the gardens, giant barrel, and sculptures. Picnicking on a sunny day is a must. Patterson Cellars (KidScore 68) Patterson offers excellent wine from several WA vineyards. Kid friendly staff and nice outdoor seating with a cool rock fountain. There is a play field next door and plenty of parking. The best kid friendly attribute of Patterson is The Station Pizzeria. Cave B Estate Winery (KidScore 88) Cave B is in a spectacular location with great views, hiking, and exploring with kids. The Tendrils Restaurant has a delicious variety of Northwest fare and a healthy kids menu and high chairs. For families the best option is to explore the local desert trails, wild horses monument, pool, and beach by the nearby Columbia River. Bonair Winery and Vineyards (KidScore 78) Bonair is a kid friendly winery with welcoming staff. Children can feed the ducks, pet the friendly dog or play with the collection of toys in the corner of their tasting room. Vin Du Lac of Chelan Winery (KidScore 75) Vin Du Lac is a good option for wine loving parents who want to go wine tasting and enjoy good food with the kids. The grounds, tasting room, bistro are kid and parent friendly. They have a nice selection of healthy items on the kids menu and lots of space for kids to be kids. Children should remain attended at all times, especially inside. Remind them to use their indoor voices. Bring a juice packet or bottle they can sip from. A good option is Apple or Cranberry Juice with a plastic cup so they don’t feel left out when mom and dad are tasting. Bring snacks, books, and a few small toys. Remember to select an adult designated driver or limit your alcohol consumption to a responsible and legal level. Got a family friendly winery you’d like to recommend? 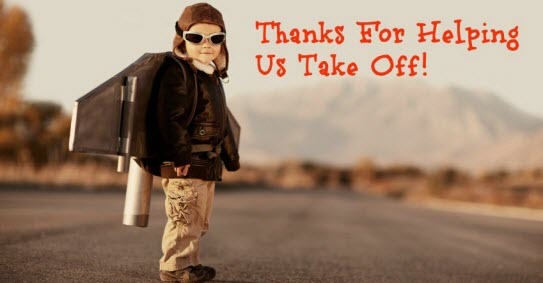 Let us know by writing a review at KidScore. This entry was posted in Judysbook on June 20, 2013 by judysbookblog. User Reviews: 4 ways Judy’s Book handles too much of a good thing. The online review space is crowded with 100s of review sites, many failing to gain traction. It’s a classic chicken and egg problem. To do well, most sites or apps need many user generated reviews, however it’s hard to gain users and engage them without reviews. In recent years sites that tended to break out and gain traction have a great experience, product, and unique niche. With Judy’s Book as our reviews grew beyond 1 million, combined with another 3 million from partners, we started to see time spent on certain pages increase but users were also dropping off these same pages at higher rates. As a review site acquires more content it gains more traction, but also experiences new problems; users might abandon as it becomes harder and more time consuming for a person to filter through all the reviews and not get overwhelmed. Here are some ways we’ve tackled this issue that are working well. Filters. 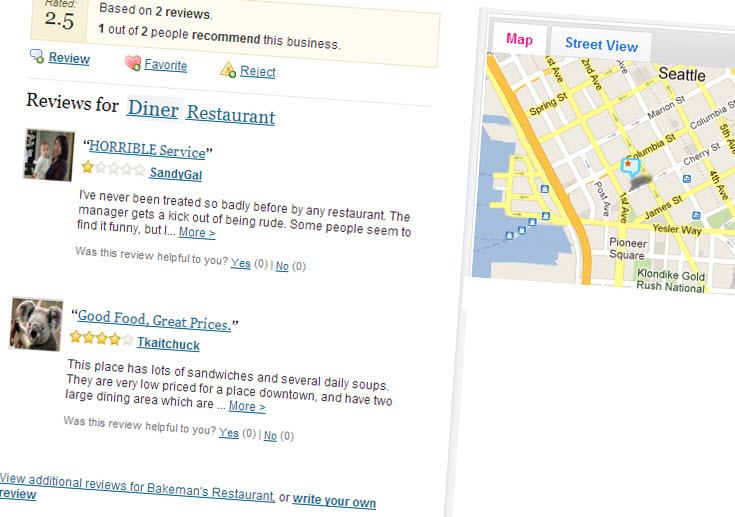 Filters and searching within reviews allow a reader to get a feel for the place quickly without reading all. I tend to read a few excellent reviews, and then go to the average and poor ones to quickly get a picture of a place. We keep in mind the persona of our audience, what they would want to filter/search, and if we have enough information on the reviewers to slice our data in a useful manner. Sorts. There are all kinds of things you can sort on; the most obvious are rating and date. Recent reviews tend to give a better picture of a place, especially since many owners read their customer reviews and use them to improve. The key here is to not go overboard with sorts and keep it relevant and simple. Best Worst showcased. Many users want to know the best and worst about a place quickly. This is a one way to combat against fake reviews that get through review site filters since some owners will hire reputation management firms to combat bad reviews by generating good ones that are more recent, with best worst the critical review is present till a more recent critical review shows up. Scores. At a glance ratings and scores tend to be popular with users because once the user understands the basic criteria for each item scored it can be all encompassing of their likes to quickly make a decision. They are also a good way to build a brand and syndicate your score to other places without cluttering a 3rdparties UI. KidScore is an example of utilizing scores. The challenge here is to determine if your users would benefit (what problems are you solving and questions are you answering? ), identify the criteria, and then generate an algorithm to accurately determine a score from review sentiment, votes, other method, or all. You’ll need a strong development team to do this well and be able to scale. Got your own ideas? We’d love to hear from you on feature suggestions and improvements. This entry was posted in Judysbook on May 6, 2013 by judysbookblog. 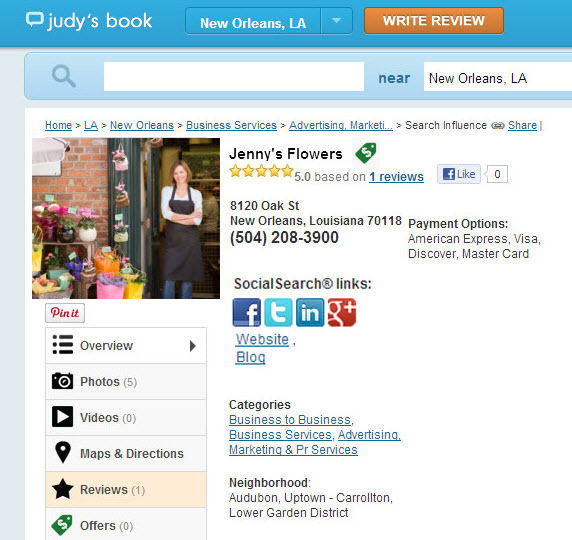 Judy’s Book adds Social Search Links For Businesses To Engage Customers. Social media links and interaction now play a huge part in a website’s search rankings. Social engagement and gaining relevant followers are also becoming more important for driving and converting customers for local search whether from Facebook, Twitter, Google+, or from other sites that aren’t traditionally known for local search like Pinterest and LinkedIn. Today Judy’s Book is excited to announcement the ability for business owners to add Social Search® buttons and links on their Judy’s Book profile to up to 8 social sites to better engage users and gain more customers. 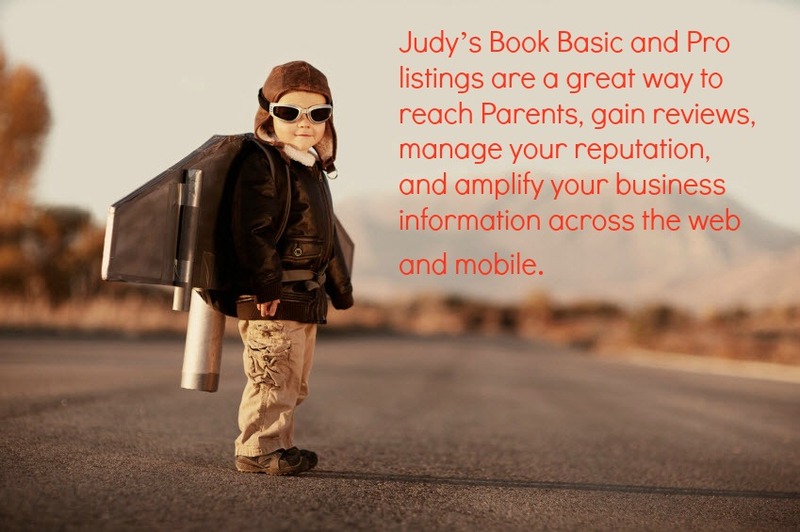 To learn more and upgrade your business listing with your Social Search® links go to www.judysbook.com/biz. This entry was posted in Judysbook on April 2, 2013 by judysbookblog. Take advantage of our greatest promotion ever! Tell other business owners in your network about Judy’s Book Basic and Pro listings, and get a month FREE for each friend that signs up. PLUS your referral will also get a month of service FREE – it’s a win- win! Refer as many businesses as you want – there’s no limit to the number of free months you can earn. Simply share this coupon code friendsfreemonth (through email, web, message board, print, or spoken word), have them mention your business after sign up, or simply let us know at bizsup@judysbookteam.com and we’ll handle the rest. .
* You must be signed up to a paid listing with Judy’s Book to take advantage of this offer. Existing customers will have credit apply to their next renewal date. * Coupon Code not required at checkout, new customers may combine the free month with other offers/coupons, simply mention the referral friend via email post sign up. This entry was posted in Judysbook on January 3, 2013 by judysbookblog. A few months back we released some features to help business owners manage their online reputation on Judy’s Book. It’s well known that reviews impact the bottom line and have been a great tool for consumers to get improved service, better products, and make superior decisions. Judy’s Book merchants can stay on top of their reputation by getting tips for responding to reviews (both positive and negative), setup email alerts to get notified at the time a review is posted on Judy’s Book, and track user sentiment trends on their business. Since we’ve rolled out the feature over 1000 listings have taken advantage of review alerts and over 90% of new merchants take advantage of this feature. In the near future we’ll be adding the ability for owners to contact a user through Judy’s Book to resolve issues while keeping the consumers private information private, the ability for owners to pick a review to showcase at the top of the results, notification for reviews from partners, and much more, for a fraction of the cost of what reputation management firms charge. To learn more about Judy’s Book Reputation management and much more for business owners, check out the owners page for more info. This entry was posted in Judysbook on December 17, 2012 by judysbookblog.